In the case of the elite para-snowboarder from Arnprior, Ont., a wide array of loving and supportive adults have guided and encouraged the positive and outgoing young man through a challenging life journey to bring him to the doorstep of international greatness. Leslie, 24, recently competed in his third International Paralympic Committee snowboard world championships at Big Snow Resort in Kelowna, B.C., with a single focus — victory. While he narrowly missed reaching the medal podium in one of his two races, he called the worlds “an unbelievable experience” and scored his best-ever result at a world championship. After struggling to an 11th-place finish in the men’s lower-limb Class 2 snowboard cross race on Saturday, Leslie roared to a fist-pumping fifth in Tuesday’s banked slalom race. In the three-run banked slalom, Leslie had one of his most memorable rides. His fastest time of one minute, 9.07 seconds came during the second run and placed him within striking distance of winning a medal and earning some prize money. He was 0.67 seconds behind bronze-medallist Gurimi Narita of Japan and 1.15 seconds back of champion Matti Suur-Hamari of Finland, who also won the snowboard cross gold medal. In three men’s races during his first two world championships, Leslie was eighth in slingshot snowboard cross (one rider on the track at a time) in 2012, as well as seventh in banked slalom and sixth in snowboard cross (one rider against another rider) in 2015. Leslie entered the 2017 world championships in a positive frame of mind. “Big White is a special place for me,” he added. “The last time I won a World Cup snowboard cross medal, a bronze, was at Big White. And it was the same day I was named to the first-ever Canadian Paralympic team for snowboard (for the 2014 Games in Sochi). Leslie, a three-time World Cup bronze-medallist and a three-time, top-five World Cup finisher in 2015-16, is familiar with feeling the love. From his devoted family (mother Carolyn, father Tim and sister Alex) who are on call 24/7 to the cancer doctors and surgeons at the Children’s Hospital of Eastern Ontario who gave him new hope to the residents of Arnprior and the owner of its Home Hardware store who form his huge, virtual cheering section to his high school snowboard coach who planted the seed to reach higher to the personal coach who developed his first meaningful training program to the gentleman who gave him a part-time job, Leslie has experienced many new beginnings and transformed them into many career building blocks. “There’s not a day goes by that I’m not thankful for all the people who have supported me,” said Leslie, who has seen the Arnprior citizens rally around him and his family when he was a 10-year-old boy battling cancer and now as a young adult striving to be a high-performance athlete. In 2002-03, Leslie played hockey for the Arnprior Packers atom rep team. During a dryland-training session in June, 2003, he noticed a bump on his left leg. X-rays revealed a cancerous tumour. After three months of chemotherapy, doctors at CHEO offered Leslie three options for below-the-knee, lower-limb amputation. He selected the Van Ness Rotationplasty, a 12-hour surgery, which allowed him to be more active with a prosthetic leg. Leslie was riding his bike 10 months later. He returned to hockey for another four years, a period when he also discovered snowboarding. By the end of Grade 9 at Arnprior District High School, he found it too difficult to combine the commitments of a hockey team with his first part-time job at the Home Hardware store. Snowboarding became his new athletic passion and working eight years for store owner Neil Slater became a real growing experience. Slater treated Leslie like any other staff member. Leslie responded with hard work in his upbeat manner. But in high school, Leslie didn’t know he could be a world-class snowboard racer. At that age, snowboarding was all about time away from school and getting down the hill quickly to be with his friends. After his Grade 12 season, teacher/coach Krista Petrie-Wallace asked him where he was taking his snowboard career. Leslie, who showed promise and talent racing against able-bodied riders, saw it only as a cool pastime. Petrie-Wallace couldn’t let this happen. 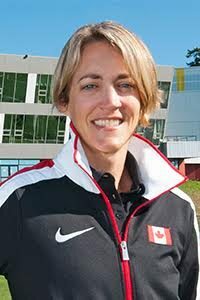 She emailed the Canadian Paralympic snowboard coach and put her and Leslie in contact. But they never met. A year later, her assistant coach Cassandra Smith got things moving because she knew the national coach. Para Snowboard Canada invited Leslie to a race in April, 2011. He accepted and competed in his first international race, a World Cup snowboard cross. Nervous but confident, Leslie unbelievably placed fifth overall and was the top Canadian. In 2011-12, he made the national team. “He grabbed the opportunity he was given and has worked extremely hard to get to where he is now,” a proud Petrie-Wallace wrote in an email. When Leslie was blindsided with cancer as a 10-year-old boy, Arnprior residents rallied around him and his family, performing numerous chores to make life easier. Leslie has never forgotten that. Before the 2014 Paralympic Games, Arnprior staged a John Leslie Day to honour its local hero. For four years, Leslie created his own training programs. But after experiencing last summer the program put together by John Abreu, a strength and conditioning coach at the Canadian Sport Institute Pacific, Leslie said: “Oh my God, what have I been doing the last four years.” He immediately felt the on-snow benefits this season of snowboard-specific training. Leslie also is thankful for his part-time job in Whistler, working as a year-round housekeeper for $15 an hour to cover his travel expenses. Every dollar counts, when you have a high-performance budget of $30,000 to $40,000 a year. In the run-up to the 2014 Sochi Paralympics, Leslie was one of the featured athletes for Petro-Canada’s Face-to-Face TV ad campaign. It gave him exposure and put a few dollars into his bank account. Could something like that happen again as Leslie eyes the 2018 Winter Paralympics in PyeongChang? Well, his agent Connor Finlay, the founder and director of C.F. Management, is working in that direction. And yet, another village member is helping Leslie shape the snowboarding career he thought he’d never have. Fortunately, the people of his support team thought differently.